The valuation of radiation levels at different locations in the vicinity of radiation installation is known as area monitoring or radiation survey. These valuations give the details about the integrity of the radiation facility or installation. Instruments used for the above purposes are called radiation survey meters and area monitors. In general, any survey meter or area monitor should consist of two main parts namely. One is a device which detects the radiation and another one is a display system to measure the radiation. 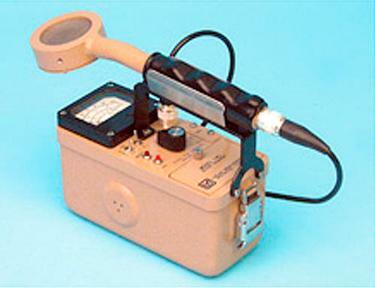 Following types of survey meters are generally used for radiation survey and area monitoring. The choice of detector is depend on the type of radiation going to measure, energy, and quantity to be measured. The above mentioned type survey meters are available in portable meters with capable of measuring radiation count rate in mR/hr or R/hr. 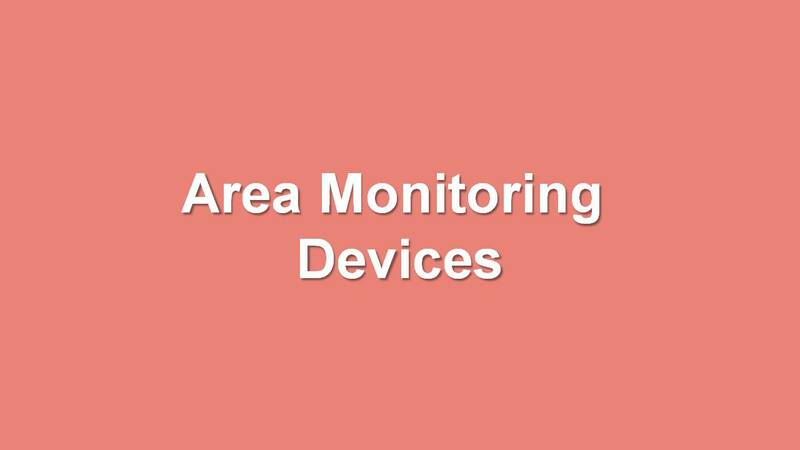 other devices for area monitoring are Gamma Zone Monitor and door way mounted meters etc. Ionization chamber consists of outer cylinder (cathode) coated inside with graphite to make ti conducting and a central electrode (anode) insulated from the chamber wall as shown in the figure. Either air or gas will be used as an interacting medium and a suitable voltage is applied across the electrodes. When the chamber is exposed to radiation, the radiation produces the ionization by interacting with the gas or air inside the chamber. The movement of ions produces an electric current in the outer electronic circuit of the chamber. The strength of this current is proportional to the number of ionization events caused by the energy absorbed in the air chamber and will serve as a measure for find the exposure rate or dose rate. 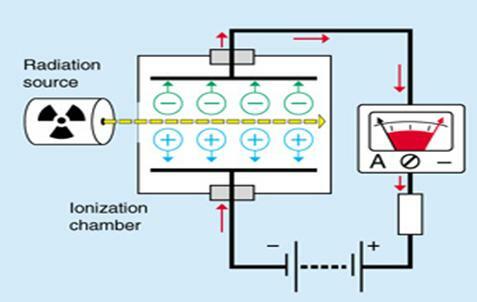 Figure shows the circuit diagram of ion chamber based meters. Number of ionizations produced in the detector is directly proportional to the energy dissipated in the medium. Therefore, energy discrimination is possible with ionization chamber for heavily charged particles by pulse height analysis. Ionization chambers are used whenever accurate measurements are required. They approximate the condition under which the roentgen is defined. Ion chambers are used to measure outputs of x-ray machine, valuation of radiation levels in brachytherapy, radionuclide therapy patients, and wards and to survey the radioactive material packages. Ion chamber are capable of monitoring higher radiation exposure rate levels and available in different ranges: 0-5 mR/hr, to 0-50R/hr. In GM survey meter operating voltage in the range of 500V -1300V applied between the anode and the cathode of a chamber, which is filled with a gas of low electron attachment coefficient (argon and neon). The electrons produced in the chamber will have sufficient energy to produce secondary and tertiary ionization during their acceleration towards anode. This results in an amplification of ionization events in the chamber. This is known as gas avalanche which depends on the nature of gas and the pressure of gas. Hence, the whole wire is covered by a sheath of electrons. The gas amplification is independent of energy and type of radiation. Halogens are used as quenching gas in GM based type Survey meters. GM meters are pulsed in nature, they should be used only in X or Gamma photons of continuous radiation. They should not be used in X-ray units, which emit pulsed x-ray units such as Linear Accelerators. 1. It is very sensitive and useful for monitoring for low level radiation especially in nuclear medicine department. 2. GM type instruments rugged and less costly. 3. GM type meters are mainly used as radioactive contamination monitor with thin window of 1.5mg/cm2, and large surface area. Contamination monitor is shown below in the diagram. Disadvantage of GM survey meter is long dead time (100micro sec) and result in loss of 20% of counts in 100,000 cpm measurements. GM survey meters should not be used un high level radiation fields or when accurate exposure rates are required. 1. What are the quenching gases used in GM based survey meters?